How to Keep Java and Class Diagram in Sync with Round-trip Engineering? Current: How to Keep Java and Class Diagram in Sync with Round-trip Engineering? You can perform round-trip engineering in Eclipse, to keep Java source code and class model in sync. In this tutorial, we will see how to create a class model and eventually generating source code from model and vice-versa. In order to follow and complete this tutorial, you must have Visual Paradigm installed, which can be downloaded from Visual Paradigm download page. Of course, you need the Eclipse IDE as well. We suppose you have already installed it but if you haven't, please download it from the www.eclipse.org and get it installed. Besides, make sure you have installed Eclipse integration from Visual Paradigm. Finally, to make the tutorial easier to follow we are not going to describe every little step required to draw a class diagram in detail. We are assuming that you have the basic skills required to draw UML class diagram in Visual Paradigm. 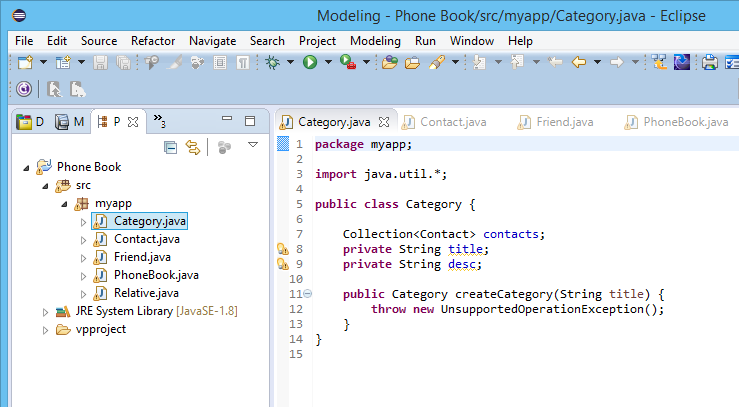 Create a Java project Phone Book in Eclipse. 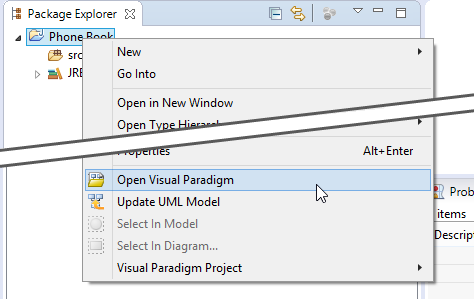 Right click on the project node in Package Explorer and select Open Visual Paradigm from the popup menu. If you see the VM Requirement dialog box, please keep the option Configure "eclipse.ini" and restart eclipse selected and click OK to restart Eclipse, and then re-perform the previous step to open Visual Paradigm. 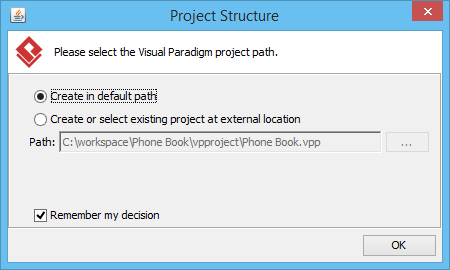 Click OK when you are prompted to select a path to store the .vpp file. In Diagram Navigator, right click on Class Diagram node and select New Class Diagram from the popup menu. A new diagram is created. Double click on the package header field at the top left corner of the diagram, with a labeled <default package> in it. Enter myapp and press Enter. From now on classes to be drawn in this diagram will be placed in a (new) package named myapp. In practice you can also enter a nested package structure like com.vp.myapp. 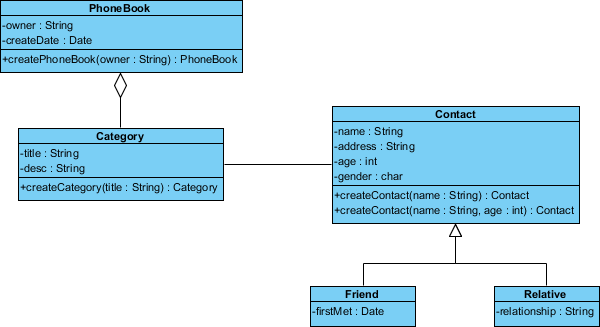 Draw the following class diagram. To create a class, select the Class tool from the diagram and click on the diagram. To add an attribute, right click on the class and select Add > Attribute from the popup menu. Type the name and type inline (e.g. owner : String) and press Enter to confirm creation. To add an attribute, right click on the class and select Add > Operation from the popup menu. Type the method signature inline (e.g. createPhoneBook(owner:String):PhoneBook and press Enter to confirm creation. To create a related class (e.g. an associated class), make use of the Resource Catalog. Move your mouse pointer over a class, press and drag out the Resource Catalog icon at the top right of the class. Let's set the role names. 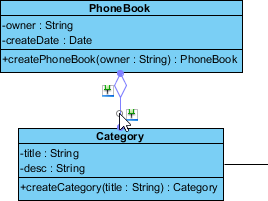 Double click on the Category end of the connector between class PhoneBook and Category. Set multiplicity as 0..*. 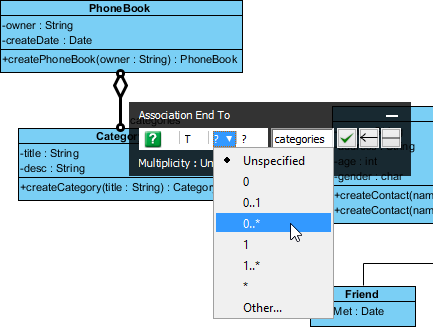 These changes will affect the attribute of category that will be generated in the class PhoneBook. 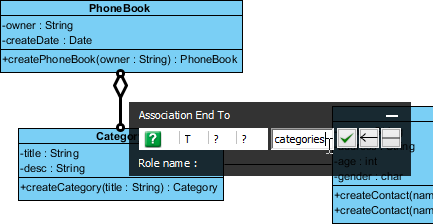 Similarly, edit the connector between Category and Contact by setting the role names of the two ends to category and contacts, and multiplicities to 1 and 1..* respectively. This is the completed diagram. Press Ctrl + S to save the project. Now comes the code generation. Click on the Update Code button on the toolbar of Eclipse. Check the Package Explorer. You should see a list of generated file. You can open them to fill in the code body. This is the end of the tutorial. 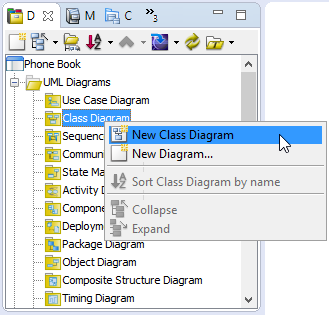 Instead of closing Eclipse now, you may try something more by editing the code like to add, rename or delete class, attributes and operations, and click the Update UML Model button, which is the one next to the Update Code button, and observe the changes that will make in the class model. Enjoy!